This summer break, two of Banff Community High School’s Grade 11 students are preparing to expand on their subject knowledge and get a true taste of different cultures, having been accepted on travel and learn programs designed to inspire students and stimulate learning in alternative environments. 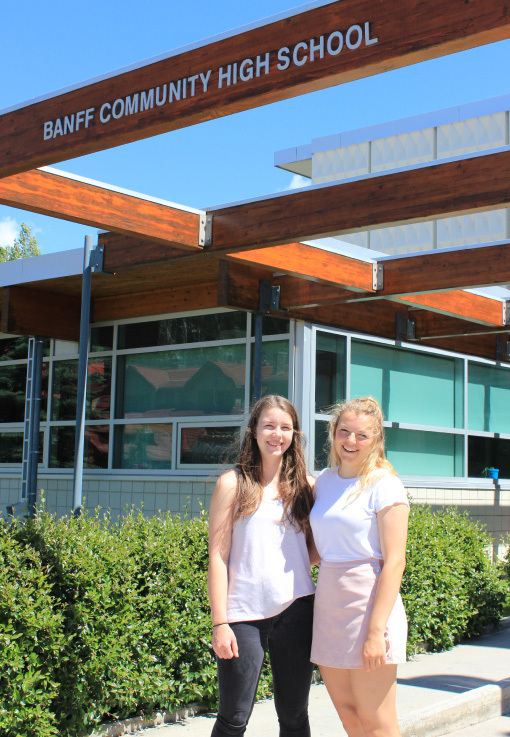 Rosie Macdonald and Kate Gibson, both 17, are set to leave Banff to independently experience month-long educational trips that complement their chosen area of study, while opening them up to new experiences. Recognizing the importance of supporting students’ personal growth and understanding of the world outside the classroom, the Wim & Nancy Pauw Foundation has awarded both students with a ‘Pauw Scholarship for Embracing Our Multi-Cultural World’. Open to Grade 9, 10, and 11 students, two scholarships – each holding a value of $500 – are granted by the Foundation on an annual basis, to enhance the cultural experiences available for high school students; broadening their horizons, advancing education in a specific area of interest, and expanding their appreciation for the diverse world we live in. “I’m excited to be working from a lab in the rainforest,” says Kate with a huge smile. First introduced for the 2015-16 academic year, the pre-graduation scholarships are part of a wider series of education grants awarded by the Foundation to deserving students of each graduating year, with 12 students to receive individual scholarships as part of their Graduation Ceremony – held on Friday June 30. For Kate, with a chosen subject of sciences, the pre-graduation scholarship will contribute to her completing an academic Biology 30 program with Blyth Academy – which will see her spending the month of August in Costa Rica. Once Kate’s place with Blyth Academy was confirmed, she submitted an application to the Wim & Nancy Pauw Foundation, hoping to be considered for the scholarship. Within this, Kate expressed her interest in learning overseas to earn the biology credits she needs to pursue her ambition of a career in Medicine. The Foundation, impressed by Kate’s extra-curricular activities – which includes various sports, weekly volunteering at Banff Mineral Springs Hospital, and being a member of Student Council and the Green Team – selected Kate as a worthy recipient of the scholarship, alongside her fellow student Rosie. Rosie, passionate about languages, is due to take a trip to Quebec, where she’ll be staying with a French-Canadian family. Inspired by her French teacher, Ms. Sutherland, Rosie has aspirations to follow a career in the French language and become a teacher herself. “I think the trip to Quebec will give me an idea of what it will be like when I graduate; to be away from home,” Rosie says. Within her scholarship application form, Rosie demonstrated her interest within the French language, as well as efforts to explore the skills needed to teach, by outlining her attendance of additional French classes and volunteering to read to Grade 1 students. Both Rosie and Kate will be participating in add-on programs around their studies; cultural excursions and activities such as cooking, white-water rafting and a jungle safari for Kate, and for Rosie, a trip to Quebec City and day experiences out to various attractions in the Province. The Pauw Scholarship for Embracing Our Multicultural World will contribute to the funds both students have saved for their trip, to cover accommodation, trips, learning supplies and daily personal expenses. The Pauw Scholarship for Academic & Athletic Pursuits – awarded to three students who have achieved personal academic and athletic success throughout high school, and who will pursue athletics at a competitive level into their post-secondary years. This year’s recipients are: Martha Pietrasik, who will attend Concordia and is already part of Team Canada in synchronized skating, John Santiago, who will attend Red Deer College and pursue a future in basketball, and Jake Huculak, who has secured a place at the College of the Rockies and hopes to play hockey professionally. The Pauw Scholarship for ‘Embracing our Multi-Cultural World’ – awarded to a student planning a cultural experience that will broaden horizons in our diverse world through travel, language studies, or other culturally immersive adventures. This year’s award recipient is: Molly Macphail, who will attend a French language course in Jonquiere, Quebec. The Pauw Scholarship for Business, Tourism & Trade – awarded to three students who are enrolled in post-secondary studies in Business, Tourism, or Trade; programs that align with or support the tourism industry. This year’s recipients are: Allison Sheridan, who will study Tourism and Environment at Brock University, Benjamin Cook, who is pursuing Business Studies at University of Victoria, and Joleen Niehaus, who has secured a place on Ryerson University’s Hospitality and Tourism Management course. 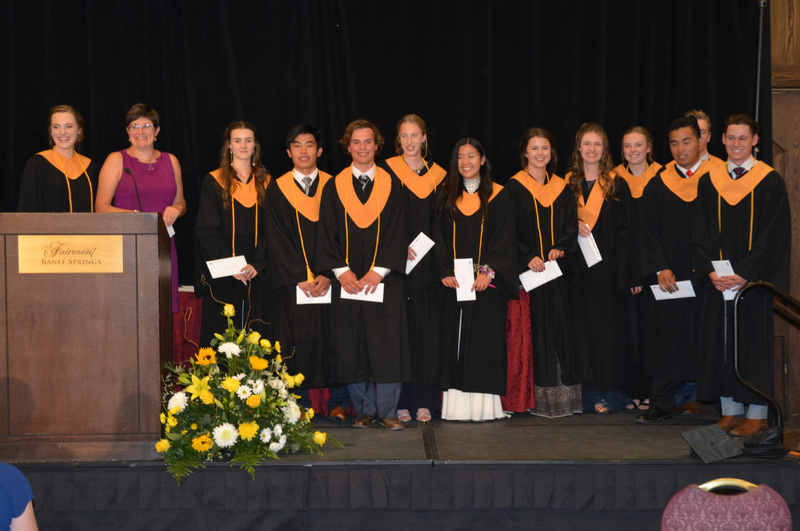 The Caribou Award –selected by Banff Community High School staff, to recognize five students that demonstrate the qualities Banff Lodging Company seeks within all its employees. These students are hard-working, engaged participators, enthusiastic volunteers, employees, and team members. They are trustworthy friends, have a positive influence among their peer network, and positively impact school culture. These year’s Caribou Award recipients are: Sage Shepherd, Luna Kawano, Xander Harvey, Jasper Dimaracut, and Amy Morton. The Wim & Nancy Pauw Foundation works in partnership with the Canadian Rockies Public Schools division, providing donations to fund Banff Community High School athletics, outdoor education programs, and dual credit courses, as well as supporting a number of programs at Banff Elementary School.